Frame drumming with Holy Scripture is a very powerful and deeply moving way of reading Scripture during public worship. It opens the text for the reader and the drummer as well as the congregation. Comments like "I've never heard Scripture come alive like that!" humble both the drummer and the reader. The phrase the the Bible is the Living Word takes on an entirely new dimension. Drum accompaniment requires preparation time by both the drummer and the reader and then practice time together. What I share below is my way of using the drum this way. Then I will provide some sample texts. Lent is a particularly fitting time to use the tar with Scripture, especially the weekly Gospel readings, Palm/Passion Sunday, Good Friday services and Easter, where the tambourine reclaims its voice in worship once again. The drummer meets with the reader/preacher to discuss one of the readings for the next Sunday. This works best if the preacher is also the reader. The discussion will shape the sermon and the sermon will shape the drumming of the readings. Decide which translation of the text will be used. 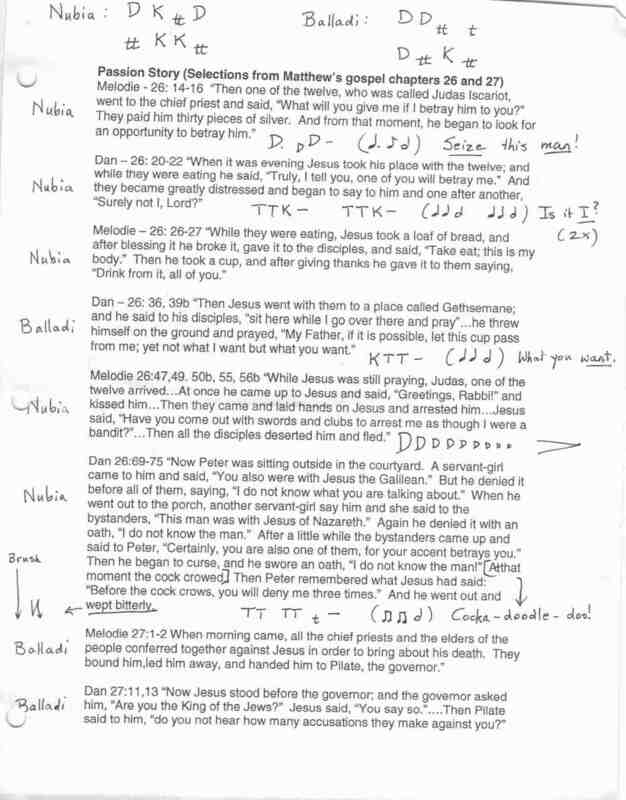 Print out the words of the reading ( from a website like bible.oremus.org/). Provide wide margins on both sides of the sheet and between the lines for the drum patterns and moments of silence that will happen during the reading. Both reader and drummer have the same copy of the words with such spacing and mark both copies with notes of what will happen. To ensure a smooth reading for the congregation, let the drum lead. By this I mean that once the text has been announced (for example, "the Gospel this morning is Mark 2: 17-23. ), allow for a significant moment of silence (anticipation and time for all to go inward). Then have the drum begin softly and perhaps slowly increasing its volume a little. Then the reader begins. When there is a break in the text for the drum, let the drum do the emphatic strokes ( KKDD or TT dependng on the text) as decided between the two of you. Then a moment of silence. The drum resumes the common pattern. After a few strokes of that common pattern, the reader begins again, and reads up to the next point of emphasis, etc. The reader and drummer come to their first practise time with ideas of what are significant "emphasis" points in the text, what might be the common pattern (drummer), and some idea of how the sermon will shape itself (the reader/preacher). Punctuating the text with moments of emphasis can help bring out the key verse or phrase the preacher chooses for the sermon theme. At the second (and probably final practice), each come prepared to drum or read following the suggestions worked out during the first practice. This allows time for the sermon to be more prepared and for both drummer and preacher to agree "Yes this works. This is how we will drum and read together on Sunday." If you are drumming for a reading during the entire liturgical season, the second practice will probably not be necessary once the two of you are very comfortable working as a team. At the end of the reading, let the reader finish first and the common pattern to continue for a few more times, fading into silence. This silence gives the congregations a moment to fully experience the reading of the text and to anticipate the sermon. In the example text below, a drummers decided to play both Balladi and Nubia as the common pattern alternated as indicated - where the text seemed to shift. The drummers also chose patterns that echo aurally phrases reflecting the text. This becomes a very moving experience for all. See also the Christmas Eve drumming patterns sent in by Mark Street United Church. Thanks, MSUC drummers! For now here is what the Toronto drummer played for the Scripture reading of Good Friday. With one reading (parable of the prodigal son), the reader and I developed a drum and reading sequence for the 2 of us. When the reference in the gospel came to the party held for the second son, a beginning drummer began playing Ctt in the background, imitating a grand party going on. It was very effective. We had expected and rehearsed that this drummer would play patterns 1 & 2 of the basic Rattlesnake, but in her nervousness, she only could play Ctt. This was an excellent adaptation on her part to the circumstances of the moment. It only served to enrich the congregation's hearing of the Biblical text. Drumming with Scripture is probably best done with one drummer, or two at most, to begin. Had there been other beginner drummers playing with this beginner, she would have been able to play the 1 & 2 parts of Rattlesnake. But volume would then have become a real concern. Also, the more drummers involved, the more practices are likely needed. Good stewardship of our time and talents is a part of drumming in public worship. You both decide! And you decide (with only a God-focused perspective) how to best crack open the Living Word for all who gather to worship God. Thank-you, Ken Holman (a Carleton Memorial United Church workshop participant), for sharing this with us all! His wife, Kathleen (a lay preacher) and Ken worked these patterns out. With this text, there is not a sustained background pattern as in the Good Friday example above. This one begins with a dramatic Doum before the reading begins and then during the reading as shown. Where K - - K is indicated, that pattern is played as background for those 4 lines. Baladi is indicated in two instances to be played while those 4 and then 14 lines are being read. The Cha's are a single stroke at the end of each indicated line. And with the text which follows, we introduce the "stroke" V. This stroke came about as a surprise and some of us are trying it out and loving it. V is the sound of the jingles when the frame is very, very (hence V) gently, barely moved by the dominant hand holding the frame with the index finger and thumb. The drum is held in the non-dominant hand as it is usually held. This works best with 3 or 4 drummers. The quiet tinkling sound has a soft, mystical quality to it, a quality that makes you wonder: ' what was that I heard?' or 'did I hear something?' Very evocative. Very beautiful. Like the trickling of a hidden stream.